Thanks to Herman Melville, Captain Ahab’s OCD has made the term White Whale synonymous with elusive objects of desire. 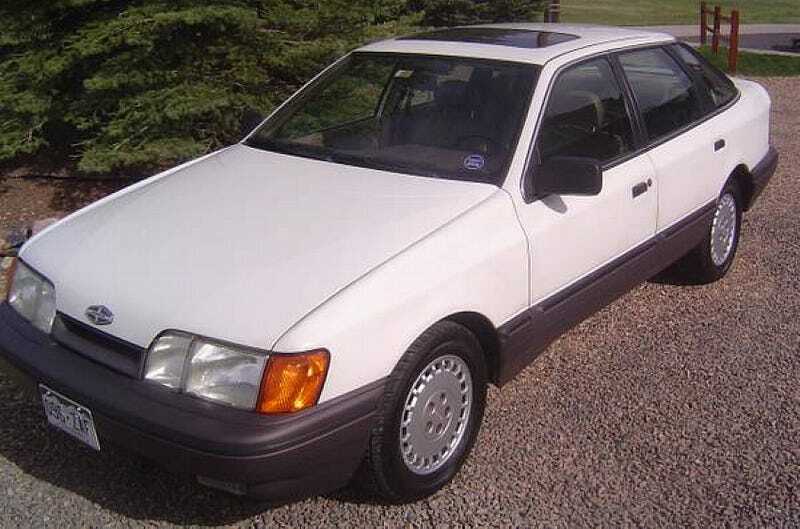 Today’s Nice Price or Crack Pipe Merkur Scorpio is both white and rare, but will its price have you saying thar she blows? Fully 72% of you thought that blowing twelve grand on yesterday’s sweet ’69 slant six Dart was a good idea. Of course it could have just been that it was a sixty nine. Heh, heh, heh, sixty nine. Jump ahead a mere 20 years and boy how things do change. By 1989 the hippies turned into middle aged investment bankers, and the apple pie goodness of American muscle cars had given way to a fondue of European techno. That decline in American luxury and performance in the ‘70s was directly countered by the rise in import marques that sought to fill the gaps, and grab a bigger chunk of the lucrative American market. It was during this time that BMW and Mercedes saw their biggest sales gains, as well as the introduction of brand new marques to capitalize on this new adoration of all things imported. Seeing the Japanese successfully launch such luxury brands as Acura - and having pretty much abdicated the high end by turning Lincoln into a purveyor of bloated crap wagons - Ford did what any car maker with a European operation would do, and introduced a line of import models under an impossibly unpronounceable name. Only lasting four years and encompassing two models, Merkur was positioned as an adjunct to the Lincoln and Mercury brands. That was because the Blue Oval bean counters figured if the company didn’t know what to do with those two brands, maybe they’ll have luck by adding a third. Unfortunately for Ford, the bean counters didn’t take into account the widely fluctuating exchange rate pushing the XR4Ti and Scorpio models into price ranges unbecoming their untested and inscrutable brand name. Today, both the XR4Ti and Scorpio are seen as failures of the moment, but not so much fail whales as cars. In fact, while seen more as curiosity than cars of ultimate desire, few would probably not admit to disliking either. This 1989 Merkur Scorpio will likely go beyond that tepid appreciation, to being a representative of Ford’s aborted Euro-brand that you might just really, really, want to own yourself. Luckily for you, it’s for sale. The reasons I think you’ll find this Scorpio so appealing are twofold - one, it has only 66K on the clock and appears to be in nearly factory fresh appearance. This is quite amazing as the bits and pieces of the German-made luxo-hatch typically don’t stand the test of time and pieces like seating surfaces, dash plastics and the little inflatable lumbar bulbs tend to look like über crap at this age. On this one, they're all just fine. The other reason why I think you will run, not walk, to praise this Scorpio is because it’s one of the 50 or so that came to America sporting a 5-speed stick and three pedals rather than the slusher that came on the 8,700-odd others. In front of that of course is the 144-horse 2.9-litre Cologne V6, and engine that is to Ford of Europe what the 302 is to its American counterpart. The car is also kitted out with full factory options including a sunroof, full leather, and heated seats. The Mercury Sable-aping bodystyle has aged remarkably well, and here the grey cladding remains surprisingly non-sun bleached. Similarly the headlamps don’t suffer the miasma of age that you might expect. And what would you expect to pay for so rare and so clean an example of a car that we all like but possibly don’t love? Well, the seller is asking $3,850 for the car and a butttload of parts and manuals. What do you think, is that a price that would make this Scorpio your white whale? Or, does that make this Merkur and mistake?